If trust and affordability are important to you, then Southside Towing is a Towing Service you can’t go past. Have you had a breakdown in the Liverpool area? If your answer is yes, and you need a Towing Service that is professional and competent to tow your car to a mechanic or garage, please call us. If you’re out of fuel, for example, we could lend you some. Alternatively, we could tow your vehicle to the nearest CALTEX, Speedway or Coles Express Liverpool where you can refuel your tank. It’s one thing to talk about value, it’s another to deliver it. At Southside Towing, we deliver value every single day to our customers. The vast majority of whom faithfully call us back for service if their vehicles break down a second time. A Towing Service that operates in Sydney’s South, we are Tow Truck Licensed by the RTA, New South Wales. All our Tow Truck Drivers possess a Driver’s Certificate issued by the Department of Fair Trading. We follow all regulations, protocols and procedures laid out by the New South Wales Department of Fair Trading – meticulously. However, if you drive a Prestige Vehicle like a BMW, Porsche, Mercedes or brand-new Ford Falcon or Holden Commodore, then we will likely send you a Flat-bed Tow Service Truck. The benefit of a Flat-bed Tow Truck is we can place your entire vehicle on our truck. This is better than dragging your vehicle, in which you may have emotional property invested, by its front wheels to your residence or nearest garage. Because the wheels of your vehicle do not touch the road’s surface, the chances of it encountering further damage are reduced. 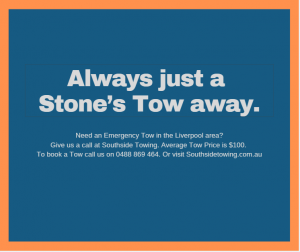 Located conveniently in Liverpool, Southside Towing remains one of Sydney South’s favourite Towing Services. Responsive, friendly, polite and efficient, we are quick to arrive on an accident or breakdown scene. Due to our service, almost all our customers call us back for service should their vehicles break down (God forbid) a second or third time. It’s the reason our customers return for service after we deliver it. 5 star-rated, we survey all our customers periodically. We use their feedback to improve our Towing Services or add new ones. Through our marketing department, we have started measuring Trust in a way no other company in our category does. Using an online tool called TrustPilot, we survey satisfaction – aggregate and learn from it.